Dr Waikaremoana Waitoki has made and continues to make a significant contribution to the development and growth of the indigenous psychology movement within Aotearoa and internationally. More recently Waikaremoana was the co-editor of ‘Te Mana Kai i te Matauranga: Indigenous Psychology in Aotearoa,’ a book that pulled together the voices and knowledge of a range of Māori psychologists throughout the country on how Māori psychologists might approach the journey of a Māori whānau in the mental health system. Waikaremoana is one of the few Māori clinical psychologists who work in a mainstream tertiary institution. Her passion for kaupapa Māori research, the growth and development of Māori students within psychology and her commitment to growing Māori indigenous psychology keep her there. Waikaremoana’s PhD research identified training content to develop a cultural competency training programme for psychology students to prepare them to work with Māori. 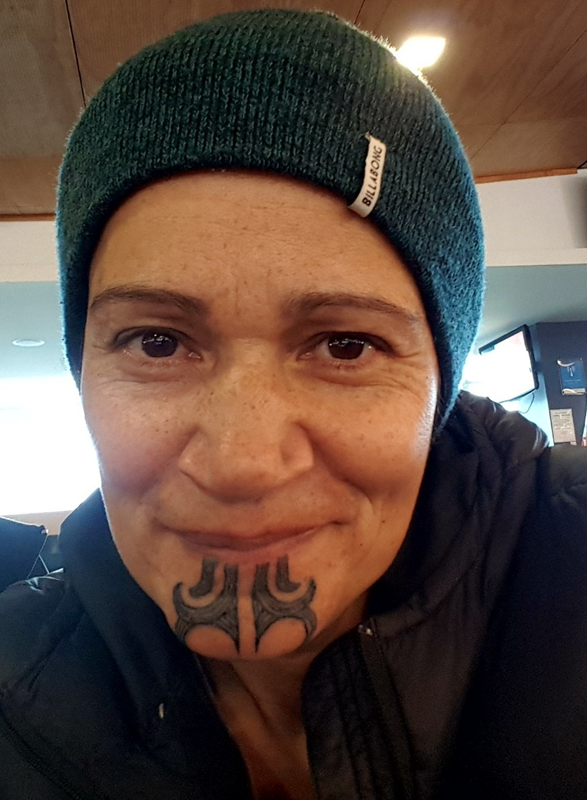 She, alongside like-minded colleagues and students, has been the force and hard work behind the only Māori Psychology Symposiums to be held in Aotearoa over the last 15 years. And she will be the instrumental force (with the support of other Māori psychologists) in establishing our first Māori Psychologists Association. Waikaremoana has continuously agreed to sit on a range of psychology committees and boards that many of us have declined. She is committed to ensuring the Māori voice is heard, and if we are not at the table, then it cannot be heard. Not only is she a weaver, but she may well be a superhero as she fends off many of the bullets for the rest of us. Don’t be fooled by that cheeky, mischievous grin of hers either. There are a sharp intellect and wit behind that grin. Waikaremoana also holds a 3rd dan in Kyokushin karate. She teaches adult and children's classes at Māia Dojo Hamilton and particularly likes to teach in te reo Māori. She has competed in full contact tournaments, Iron Māori and the Tussock Traverse. She and her partner have raised all their children (and now mokopuna) to speak te Reo Māori. They are a fluent te reo Māori speaking whānau. For us, her Māori psychology whānau, she is our weaver. Pulling together the threads of the small but growing Māori psychology whānau from the four winds for a range of different kaupapa. We need leaders like her that weave us together and keep us connected. We acknowledge the energy this takes, and we thank you Waikaremoana. Waitoki W. & Levy M.(Eds) (2016) Te Manu Kai I Te Matauranga: Indigenous Psychology in Aotearoa / New Zealand, Wellington, New Zealand : The New Zealand Psychological Association. A new book, edited by NPM Principal Investigators, Drs Waikaremoana Waitoki and Michelle Levy which was launched at the New Zealand Psychological Society's annual conference in Wellington. Te Manu Kai I Te Matauranga brings together the perspectives of 18 Māori psychologists as they deal with the case of Ripeka, a young woman facing mental health challenges. The book allows the authors to approach varying elements of Ripeka’s care and provides vivid insight into Māori psychological practice. Dr Waitoki says "Te Manu Kai I Te Matauranga is the fulfilment of a long-held vision for Māori practitioners, researchers and teachers of psychology to claim their space within the discipline of psychology. Within this book, we implicitly challenge the notion that we must reside solely within the western space and forgo our indigenous knowledge base. Many of the authors have been in practice for over 20 years – all activists and warriors within psychology." The book launch was followed by an enlightening discussion between Waikaremoana and Kathryn Ryan on Radio NZ on the 30th November 2016.